Every now and then, a good book may be a reference book you can turn to again and again. If you are a person who writes or speaks, you need to have a reference of great quotes handy all the time. Seriously. 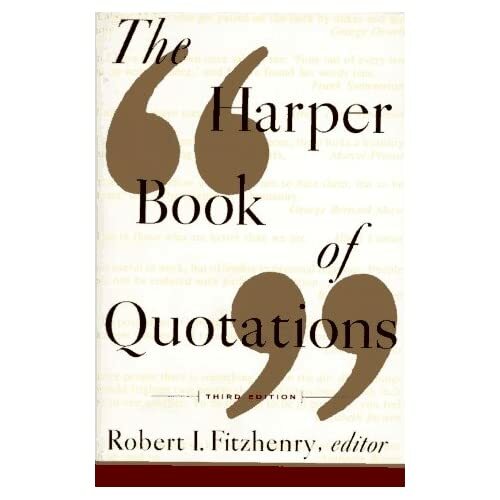 The Harper Book of Quotations, Third Edition was published too early to include any George W. Bush gems, but contains over 6,500 quotes from both the famous and obscure. Sorted by topic, such as Adversity, Education, England and the U.K., Honesty, Sport, Success, Work and 194 more catgories. Fully indexed by source, so you can find, say, all 40 of Oscar Wilde’s quotes, or just the one by former President Clinton. It would be nice to have a fourth edition out soon. There were a few good things said in the past few years. You’ll have to search the web for more contemporary quotes from greats like Seth Godin, Alan Weiss, or Craig Valentine. This is a reference book that would be useful on your shelf. You should have no trouble getting it for less than the $14.95 retail price.